Valid since January 1, 2018. A proof of payment of the fee is a 2-part sticker. Part one of the sticker is to be placed on the inside of the windscreen. Part two of the sticker is to be retained. Fill in the registration number of your vehicle legibly in the places indicated on both parts of the sticker. Use pen, not pencil. Where to put the sticker: The complete surface of part one of the sticker must be attached to the bottom right of the vehicles windscreen inside so that the driver's view is obstructed as little as possible and the sticker is clearly visible from the outside. Retain part two of the sticker for check purpose. 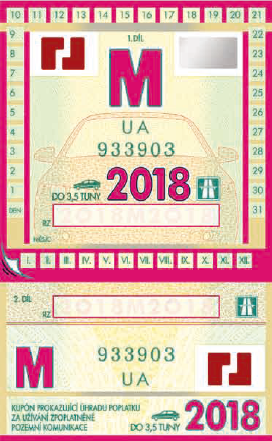 During police checks, both parts of the sticker are required. 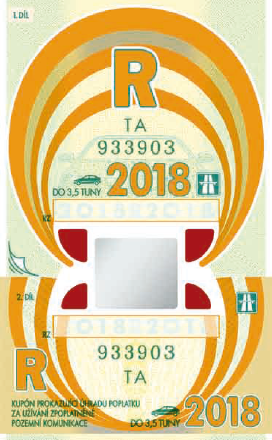 Stickers not fully attached to the windscreen, or on which either the validity period or the vehicle's registration number is not filled in, are invalid. After the sticker has been attached to the windscreen, it cannot be re-used for another vehicle. The sticker is valid even if the vehicle's registration number has been changed. 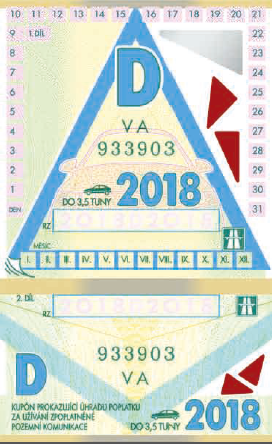 The sticker should be removed from the vehicle after its expiration date. Penalty: Fine of up to CZK 5,000 or a penalty notice of up to CZK 100,000 in administrative proceedings.